To record the last 30 seconds, go to the game’s settings and look for an option to run the game in a window. Once it’s running in a window, press the Windows logo key + G, select Settings, and select Record game in the background. To make a clip, go back to full screen and play some more, then press the Windows logo key + Alt + G.
If those shortcuts don’t work, run the game in a window and press the Windows logo key + G, then select Yes, this is a game. You should be able to use Windows logo key + Alt + R and Windows logo key + Alt + G when the game is full-screen again. Some games block the Windows logo key, but you can create keyboard shortcuts for Game bar that don’t include it. 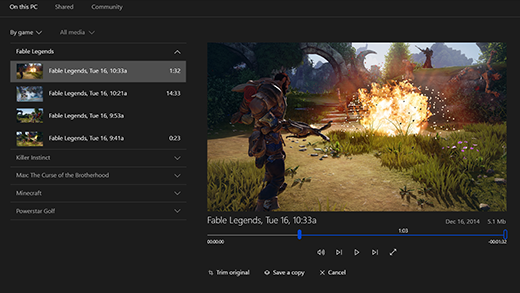 Go to Start > Xbox > Settings > Game DVR > Keyboard shortcuts to get started. If the new shortcuts don’t work, the game might be blocking all keys, and you won’t be able to use Game bar.